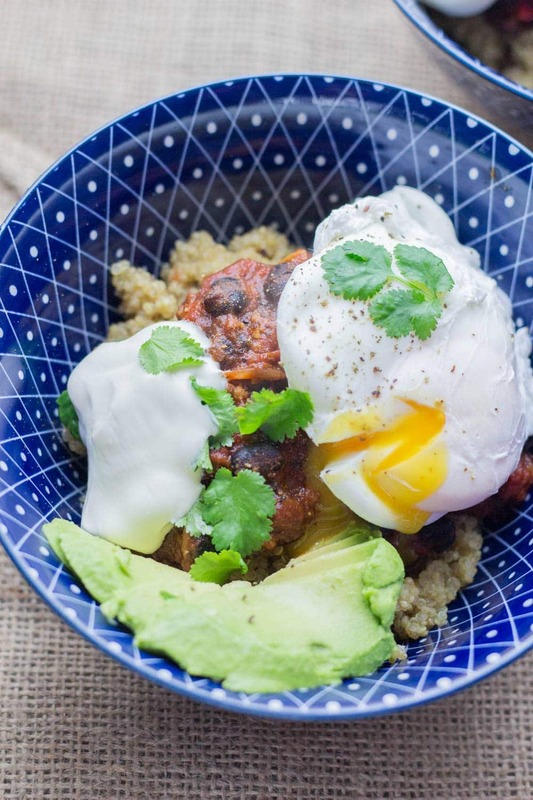 Try these huevos rancheros quinoa breakfast bowls for a fun and healthy change to your usual breakfast. I like mine topped with a poached egg for extra protein and loads of lime and coriander. These would make an amazing breakfast in bed! Hey chums. My life has officially been taken over by watching Friends. It came on to UK Netflix on the 1st of January and, I’m about to tell you something shocking here, Will has NEVER WATCHED FRIENDS. I find it entirely bizarre how a person could have grown up in the 90s and early 2000’s and could never have watched Friends all the way through 5000 times but there you go. So now we’re watching it from the beginning and I am getting all the nostalgia, season 1 Friends is my favourite ever. Anyways, on to these huevos rancheros quinoa breakfast bowls. It’s totally not weird to have quinoa for breakfast. Ok, maybe it is a little bit weird. But it definitely works! And these are most definitely a healthy, healthy breakfast. Just loads of good stuff from the quinoa to the tomatoes to the beans to the eggs. We always want special breakfasts at the weekend and sometimes we fancy something other than a bacon sandwich or the usual. 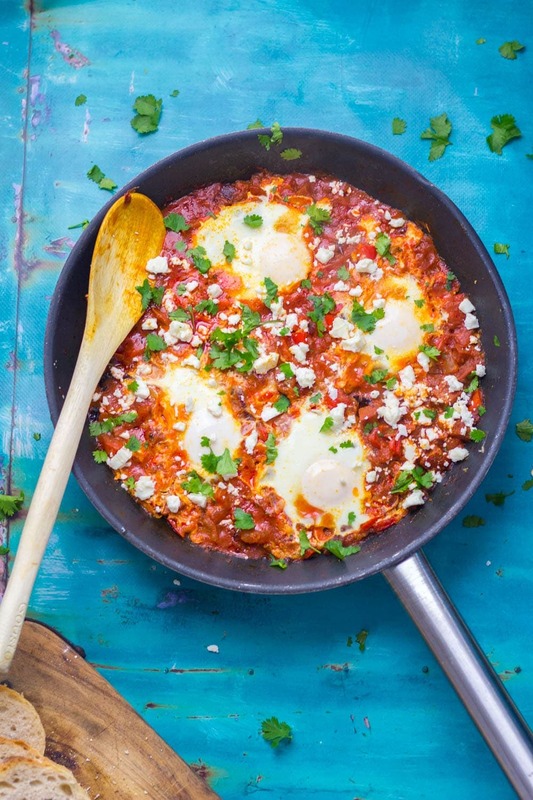 Whether it’s a shakshuka with some amazing crusty bread or some kind of hash with potatoes and vegetables it’s just so nice to have a big treat breakfast sometimes, you know? Breakfast bowls just have a great ring to them don’t they? They make such a good breakfast in bed idea because they’re super easy to curl up with and scoop up all that goodness. 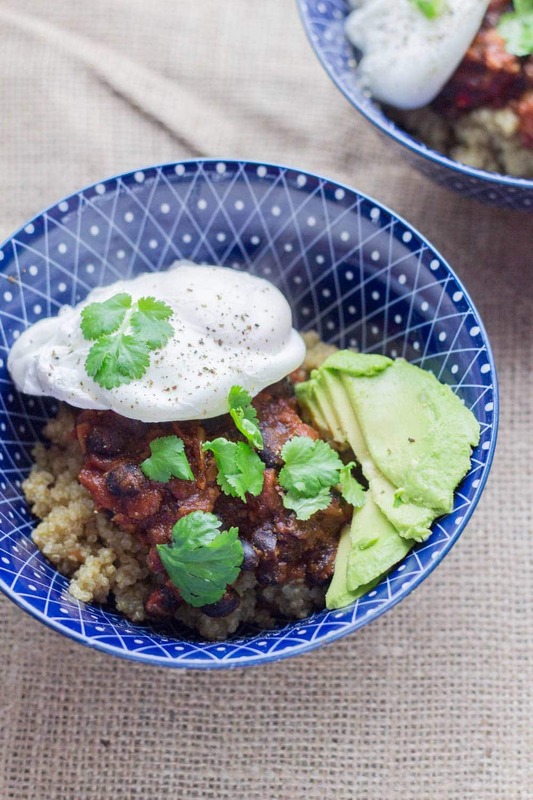 So anyways, this quinoa breakfast bowl is perfect topped with all your classic huevos rancheros toppings. Think coriander, lime, avocado and sour cream. 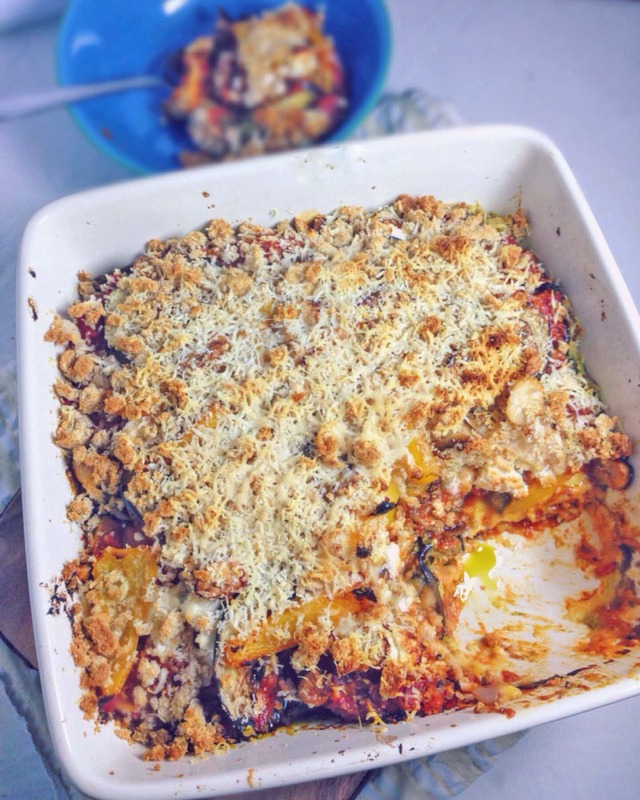 They’re a little bit spicy and super filling what with all that healthy quinoa in there so they’re great for setting you up for a fun weekend! 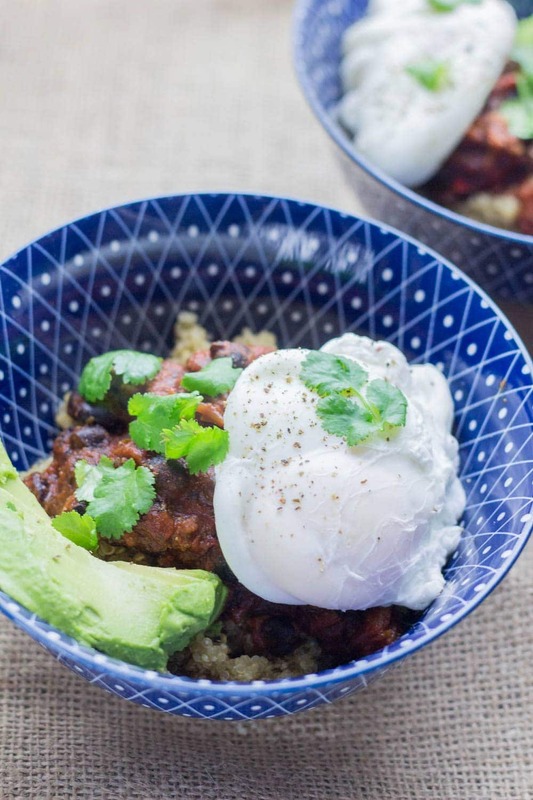 If you feel like making breakfast in bed for someone special then these huevos rancheros quinoa bowls are a great option. 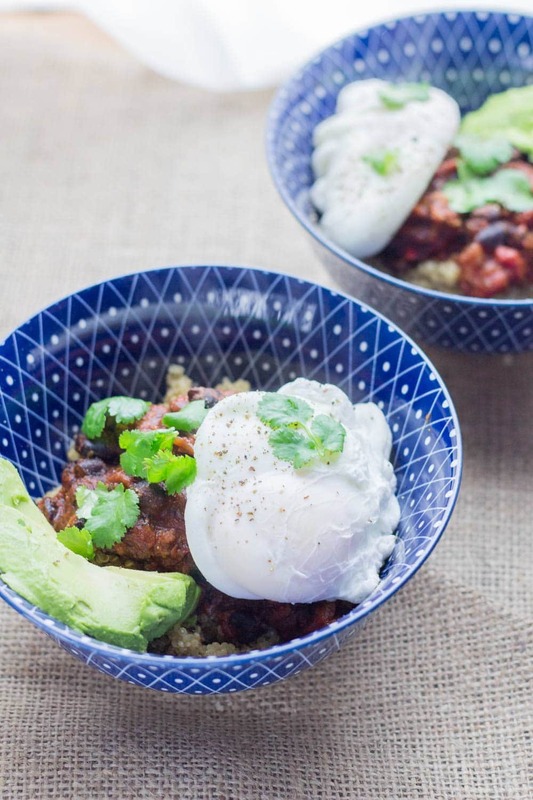 WONDERING WHAT TO DO WITH THE LEFTOVER INGREDIENTS YOU’VE GOT FROM MAKING THESE HUEVOS RANCHEROS QUINOA BREAKFAST BOWLS? 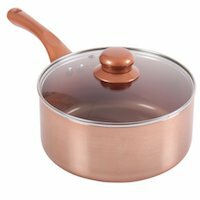 Heat the olive oil over a medium heat. Add the onion and cook until softened. Add the garlic and chorizo and cook until the chorizo is starting to crisp up. Stir in the chopped tomatoes and cook for another 10 minutes until starting to thicken then mix through the black beans until heated. Split the quinoa between 2 bowls. 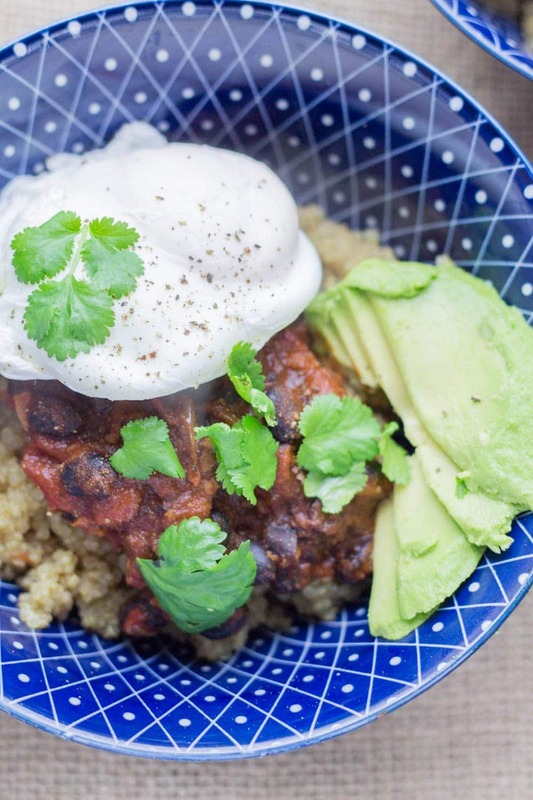 Top with a helping of the chorizo sauce a poached egg and whatever toppings you fancy! Great timing, have been looking for more healthy breakfast options! I have quinoa for breakfast all the time. Only I put brown sugar and heavy cream on it. This looks way more interesting, not to mention health. These look so good – a great way to start the day! I think I’ll add a poached egg to mine too! 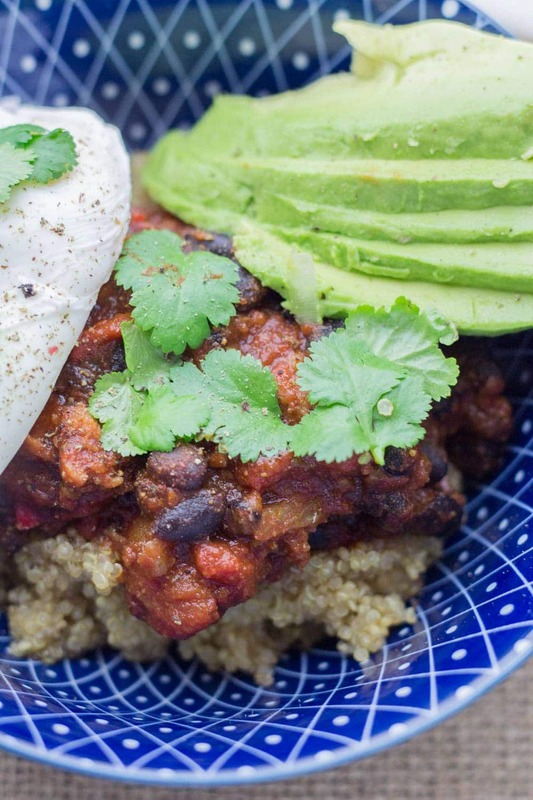 You’ve combined two of my favorites in this breakfast bowl. 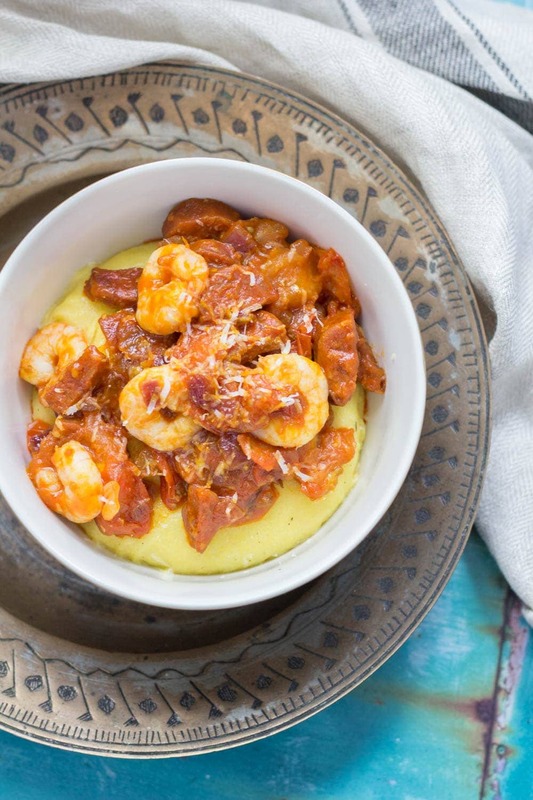 And love the leftover recipe ideas too!